LG RO water purifiers have periodic UV light sterilisation of the stored water to prevent bacterial growth inside the SS water tanks. The other unique process they have in their water purifiers is the 'Electrolysis Sterilizing Care'. Electrolysis Sterilizing Care is a process unique to LG water Purifiers, by which they electrolyse water to obtain hypochlorus acid solution which is used to flush the whole water line in the water purifier. 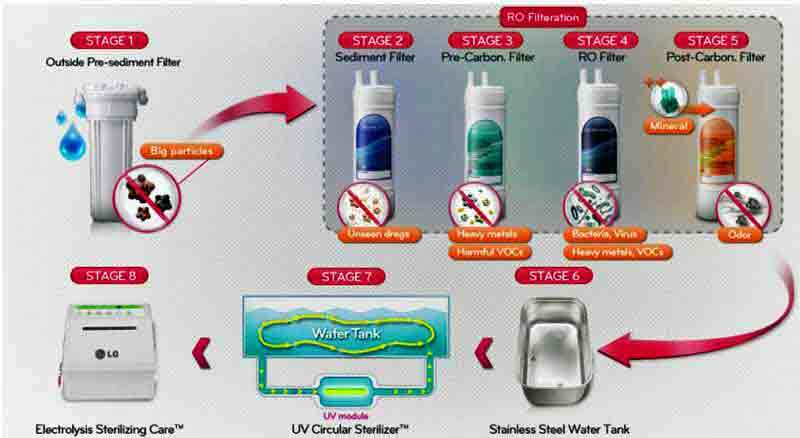 This process will sterilise all parts of the LG water purifier that comes in contact with water. Another feature available on some of their models are filtered clean water to wash vegetables and other food items. LG is a late entrant into the water purifier market in India, but already they are capturing a major share of the Indian market for water purifiers. The LG RO water purifiers costing ₹44,290- at list price, has 'Hot' and 'Cold' water dispensing function. This means out of one tap you get boiling purified RO water ready to make coffee or tea at the press of a button. Similarly through the second tap you get ice cold water at the press of a button. So LG water purifiers have a built in electric coils to heat the water and also a cooling mechanism to make ice cold water. It is these facilities which make the LG top end RO water purifiers so expensive, more than double the price their plain RO water purifiers. Stage 1: Outside Pre-sediment Filtration 20 micron element to remove larger particles like dirt, mud, etc. Stage 2: Sediment cartridge Filter 2 micron element with finer pores to remove fine suspended solids that may have passed through the pre-sediment filter. Stage 3: Pre-Carbon cartridge to remove chlorine from water to safeguard the RO membrane. Stage 4: RO Filtration - Removes all impurities and contaminants in water including dissolved poisonous chemicals and heavy metals. Stage 5: Post-Carbon cartridge to improve the taste of water. Stage 6: Stainless Steel Water Tank, advantages: No concern of bacterial contamination because the spread of bacteria, germs, etc. prevented of Stainless steel surface. 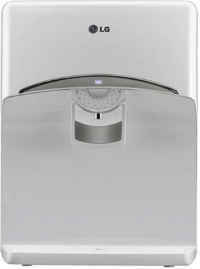 Stainless stell also does not impart any plastic taste to the purified water. Stage 7: UV Circular Sterilizer - A sterilising system for the complete surfaces of the water purifier that comes in contact with water. It works automatically for 30 minutes every 6 hours. Stage 8: Electrolysis Sterilizing Care™ - Another additional sterilisation system for the all water cantact surfaces in the LG water purifier.